The first hypercubes we printed are a collection of 12 objects that represent 12 steps of a hypercube’s full rotation around an arbitrary 4dimensional axis. The rotation was computed by Ken Perlin, who visited us at the A.R.T. Lab. I even included little binary indicators that should allow to distinguish and sort the sculptures into the right order (see the little knobs on the bottom squares). The print turned out to be too fragile, and some of the too thin connections broke. 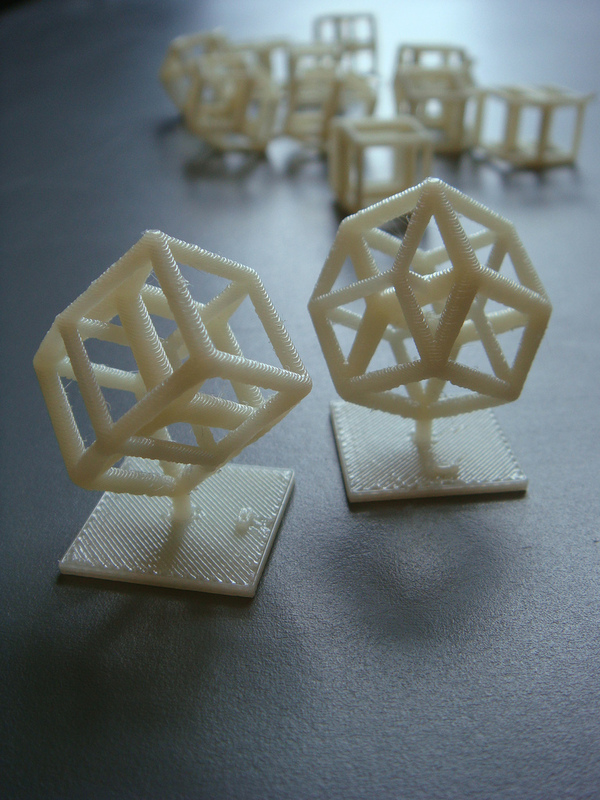 Important 3D-print lesson on the way: we learned that thin columns that are printed vertically are not very strong. Also, by having a hypercube rotate the whole 360 degrees, you ultimately end up with 4 similar quarter-circle roations. Every third sculpture looks exactly the same, only rotated by 90 degrees. Not very exciting, especially since it is already very hard to make sense of what is going on with only 12 frames. Next we decided on printing the whole zoetrope as one object, by printing all 12 sculptures placed and attached to a flat ring. This ensures the precise positioning of all the sculptures. Small discrepancies in the placement of the objects might look like hickups in the actual animation, once rotating and seen under strobe light. Also, instead of rotating 360 degrees, the hypercubes tumbles on the floor by only rotating 90 degrees before returning to its exact starting position. Additionally it also rotates around those 2 dimensions that are not involved in the tumbling around the circular track. Ken made a static animation test, he rotated the platform exactly 12 parts of a circle and took pictures of it. I built a simple and fast zoetrope mechanism, that allowed to hand-rotate the platform while the rotation would activate strobe light coming from a set of 6 super-bright LEDs. Because of the lack of a immediately-available proper motor, we decided on hand-spinning. So a chip-activated flashing of light at a exact frequency was out of question. The hand-spinning mechanism would have to be directly linked to the flashing of the lights. I fiddled around with it a bit, before deciding on the solution that seems most friction-less. The bottom of the rotating platform has 12 metallic tape connections, they look like the spines of a bicycle wheel. Underneath the platform two conductive flexible springs are responsible for making a connection every time both springs touch one of the 12 metallic tape connections. This then makes the LEDs flash and our eyes perceive the object (while otherwise being in pitch black darkness). And it all actually worked! 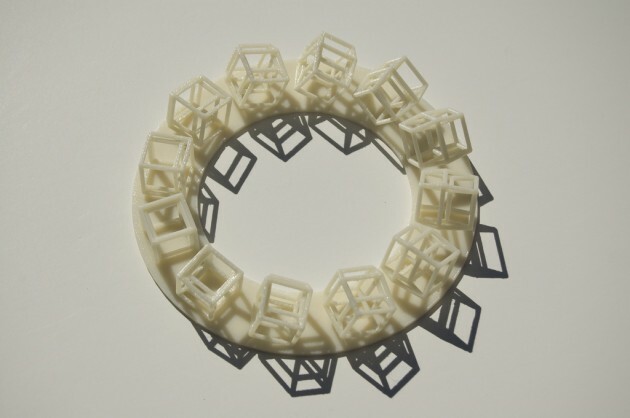 Posted in Research and tagged 2010, 3D print, ARTlab, hypercube, zoetrope.